The annual NAB Show in Las Vegas is invigorating, allowing us to reconnect with old friends and recalibrate our technological focus. Among this years top ten hot topics are Content in the Cloud, Streaming, and Podcasting, all of which you’ll see in operation at Booth N6319, Backbone Networks. No other company on the show floor will bring together such a completely virtualized radio production environment, all operating in the cloud to guarantee Your Station Anywhere. Look closely so you can find our diminutive stand, where a student crew from Robert Morris University Radio will be broadcasting live — demonstrating how they produce live and automated shows in the cloud, stream them, and automatically generate and publish podcasts — with just a Mac, a mixer, and a couple of mics. New 3rd Party Hardware — including an exciting new mix-minus portable mixer for sports and talk radio remotes, and new hardware concepts for creating your own robust cloud. The two new products that make this possible are LUCI® Global and Backbone Co-Host™, complementary cloud-based radio “backhaul” services. When married together, they allow talk radio stations to produce live programming from anywhere in the world with the simplest of equipment and no physical infrastructure. The LUCI product series has been bringing high quality “reportage” from the field for about ten years now, and their licensed LUCI Live app is accepted as the gold standard for turning mobile phones into remote broadcast platforms. 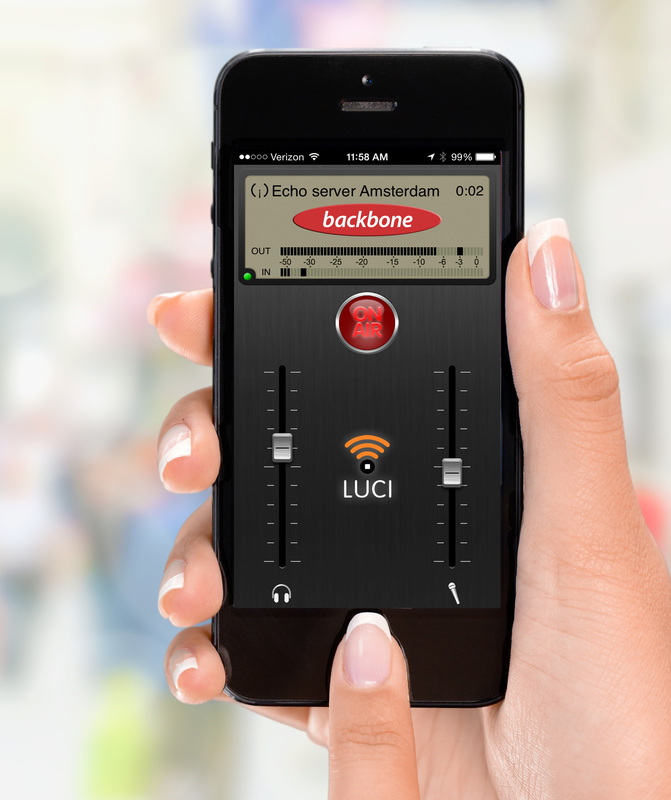 Their new LUCI Global iOS app takes this concept a big step forward—the easy-to-use app is free on the iTunes store for anyone who wants to contribute professional audio content to any broadcast station around the world. That is, any station that subscribes to be listed in the LUCI Global directory. Imagine the incredible network of live correspondents who will become available to stations around the world, and the number of news outlets available to freelance reporters everywhere! Backbone Co-Host is the software used by the radio station to receive, answer, conference and manage these incoming feeds, in full studio quality. The software, like all Backbone software, runs on a Mac. Like our phone system in the cloud, Backbone Talk™, it uses the intuitive call screener/producer and host/talent screens. Those stations that use both Backbone Talk and Co-Host are able to conference together remote guests, co-hosts, reporters, as well as listeners on the telephone network. All of this takes place in the cloud, managed by the host and screener, wherever they happen to be at the time. Remember, Your Station Anywhere. See more about LUCI Global and Backbone Co-Host. Visit LUCI at IBC 2015, Stand 7.C09, Hall 7, where representatives of both companies will be on hand for business and technical discussions. RAI Center, Amsterdam, Sept. 11-15, 2015. 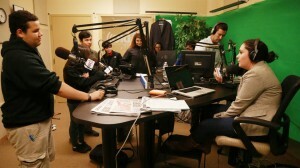 Brian Foster, a junior at Excel High School, speaks on air in the Herald Radio studio with Joe Battenfeld and Erica Moura during a visit to the Boston Herald. The biggest sport in Boston might really be politics, and Boston Herald Radio is giving the youth of New England a voice in the events. The city’s “watchdog newspaper” tells how students from area high schools were honored guests on a half hour special show to discuss their view of the political landscape. Read the article here. Boston Herald Radio is produced digitally online using Backbone Networks technology and service, and is carried worldwide online and terrestrially in the greater Boston area. Backbone Networks also operates the largest network of student-run college and high school radio stations. At Backbone we take pride in using open standards where possible. We have found that one of our local radio industry neighbors, Comrex, does too. Their product line has consistently applied the best in current technology to the specific needs of broadcasters. We’d like to thank them for the shout out about working together in support of some of our mutual customers. While it is a bit pre-mature to announce the Backbone product it is safe to say we think our Internet radio customers will find a great new way to distribute their content in the near future. Our customers often ask us for guidance on what equipment to purchase in setting up their radio stations, especially their remote broadcasts, when running Backbone Radio. There are virtually limitless configurations that can be supported, and often the answer is “it depends.” The answer is often colored by your budget, what you are trying to accomplish with your live remote and your preferences in equipment and operation. Let us lay out some of the basics. First,you will need a Macintosh® computer. Clearly a portable Macintosh like a Macbook Air makes it easier to carry the equipment. If you want more screen real estate, the 13-inch Macbook Air may be a better choice than the 11-inch version. For audio input into the Macintosh it will depend upon our needs at the site. For example you may need just 2 microphones for play by play and color at a basketball game and all you need is something like an M-Audio M-Track. For Microphones it is really a matter of taste. We have been using Shure 58’s and have found them to be quite reliable. Headphones with good sound isolation are also critical. Again it is a matter of taste and we have found the Sennheiser HD-205 II. One of our customers is using an Audio-Technical BPHS1 combo headset and condenser microphone. It simplifies the set up and makes it easier to transport the remote kit. Of course the most important thing is an internet connection that is rock solid. Many venues now have an Internet drop so you can use that. We recommend that you go to the venue the day before the remote to test the network connection and clear up any issues you may have with firewalls and spotty service. Still, that leaves you with a single point of failure. To address this we also have a portable WiFi device in our remote kit. Which one to get is often up to your location, the coverage available from the providers and how congested the network could get during the remote. Imagine running your show on an AT&T network at the Meadowlands with 90,000 people uploading YouTube videos, pictures to Facebook and all sorts of other traffic. That could impact your ability to get a consistent network connection. We have found that in major metropolitan area where Sprint has WiMax coverage it is a great solution. Longer term you may want to find a solution for where you find you are running the most remotes. As the telecom networks are built out further I expect it will become easier to get a reliable network connection. Something to track going forward. We have put together a page of devices and items that we have used along with those of some of our customers. If you use something different and it works great please let us know. Happy broadcasting. 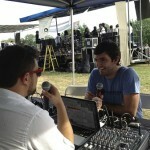 Ben Maitland-Lewis interviews Boston-area recording studio owner Dan Cardinal at the Jamaica Plain Music Festival. The Backbone Network’s control panel is on the computer screen. There’s something about a nationwide snowstorm that makes us wax nostalgic about what we did last summer. 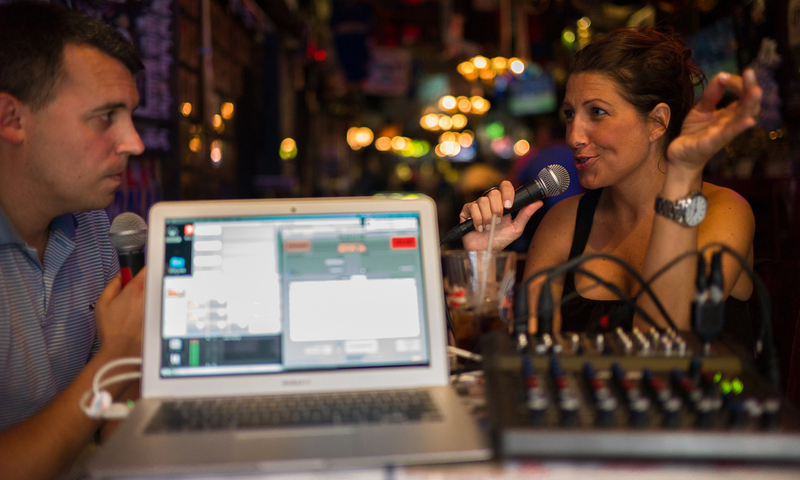 Sure, we were busy last summer developing sports and talk radio, as well as getting one of the country’s top newspapers broadcasting live online. But we also took time to smell the roses and listen to the music. The first week of September we again helped Boston’s Jamaica Plain Music Fest showcase local musical talent to an audience that now spans the globe. 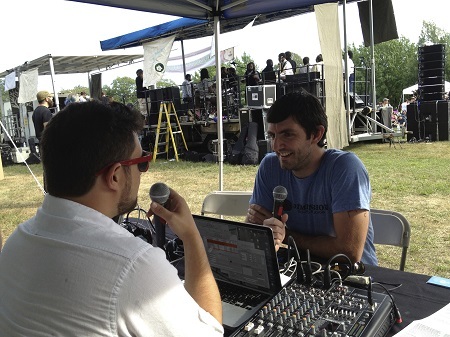 One of the coordinators of the event, Charles McEnerney, wrote up a user report for RadioWorld Magazine, describing how he was able to do this “smoothly and professionally” on a limited budget, and what equipment he used to broadcast the two-stage event. McEnerney, a respected media consultant at Layers Marketing, also compares the broadcast with what he did for the Future of Music Coalition (futureofmusic.org), at their annual Future of Music Summit. And while we have the opportunity, we would like to thank the on-air talent who turned a great event into great radio: Boston TV and radio personality Melissa Gaudette and Ben Maitland-Lewis, CEO of Presskit.to. 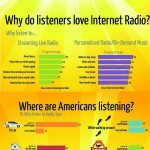 A recently released infographic from BrandSavant.com indicates that 53% of online Americans listen to “streaming audio” in one form or another. It distinguishes among three large categories: Personalized radio (Pandora and iTunes — music), On-Demand Music (esp. Spotify), and Live Streaming (TuneIn, Backbone and others). Music, music and everything. This could alternatively be framed as: Robot DJ, Infinite iPod and Radio. Certainly, Pandora and Spotify perform their functions with wonderful precision, but neither fills the function of real online radio any more than MTV and VH1 complete the cable television experience. Twenty-seven percent of the people, and we think that number will soar when in-car dashboards are better connected, listen to the thousands of live streaming stations available on tuners like TuneIn. And, what is the composition of the programming on these stations? Much of it is music, some of it personally curated by talented program directors, and some of it produced on autopilot. It takes a lot for a station to stand out among the crowd. At Backbone, we’re fortunate to work with clients who really know what it takes to make radio great. We work with faculty advisors who understand traditional radio and teach their students how to apply that experience into online radio which represents their colleges and high schools. We work with seasoned news organizations and professionals to create compelling talk radio that engages listeners and callers from around the world. We work with professional and Division 1 NCAA teams and leagues who create an exciting blend of live play-by-play with interactive halftimes and 24/7 team-related sports content. This is real radio. Music is wonderful, whether you listen to it passively or actively grab it on-demand. But there is much more to radio than music, just as there is much more to music than radio. We love being part of the 27% of the radio you can’t get from Pandora or Spotify.